Les Fitt announced at the September 1968 meeting that the club had approval from the Council to use the site off Waipuna Road. 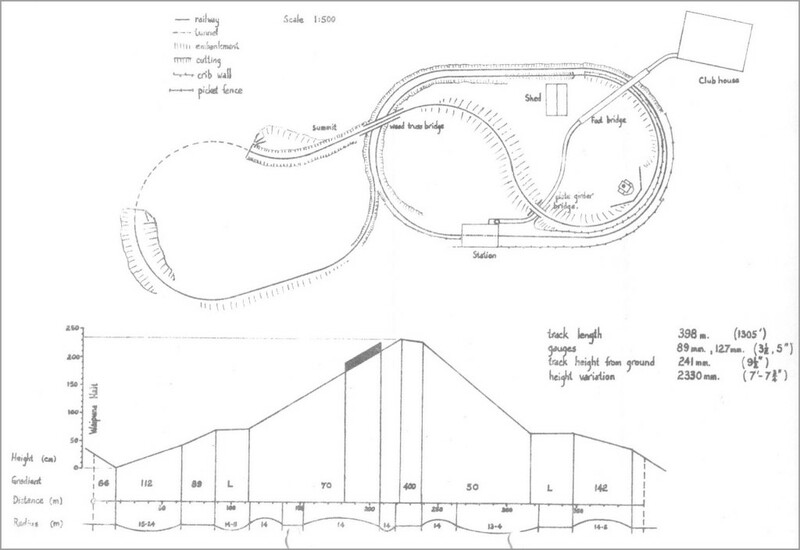 Peter Anderson undertook to prepare a provisional layout of a track design to incorporate the physical aspects of the area. 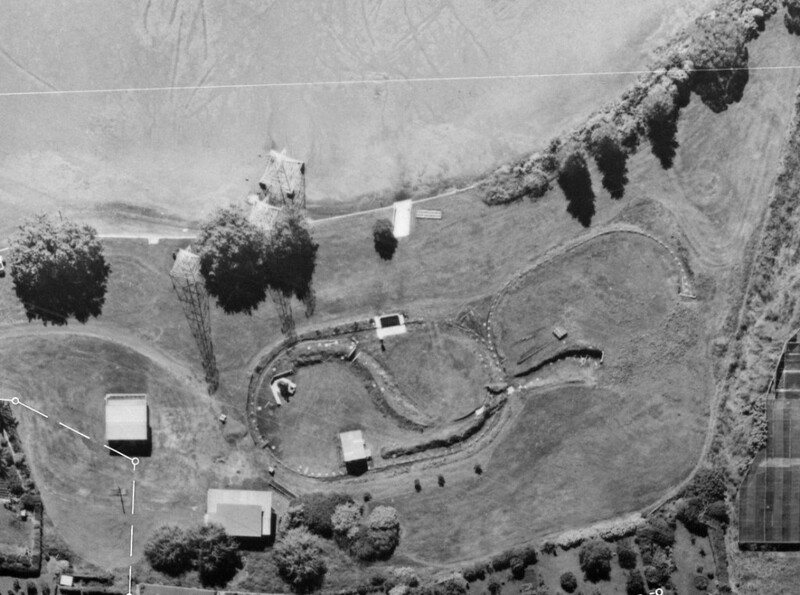 Harold Joynt managed to have the last run on the Swimarama site track on the 13th of October and by Labour weekend sections of the track had been removed to allow access for trucks and bulldozer into the centre of the oval. At Peterson Reserve, a bulldozer was brought in to excavate space for a concrete block basement for the clubhouse, and a cutting in the south east corner for the track. Club members got stuck in with a will at the new site, and during November the earthworks were completed for the clubhouse base and the oval circuit for the old track had been roughed out. By the end of the month most of the concrete block work for the clubhouse was finished, and the veranda from the clubhouse at the old site had been removed. The December 1968 general meeting was the last to be held in the clubhouse before the building and the track, which had been broken into sections, were transported to the new site. In January 1969 the clubhouse was lifted onto a platform adjacent to the block basement from where it was rolled into place. Members were busily employed in placing and levelling the track pads before the track sections from the old site were lifted into place. The track had been lifted in 20 foot sections using a strongback, and was placed onto the newly placed blocks and pads, with minimal damage, the whole operation only taking two weekends. By February the 440 foot oval track had been re-erected and the first run was made on the 23 February 1970. New stairs were erected to the top floor and the meeting was held in the now elevated clubhouse. The clubhouse was completed by the end of the year and a toilet fitted under the kitchen extension on the western end of the building. A water collection tank for the locomotive boilers was installed on the verandah. This was fed from the roof downspout and supplied the raised water tank at the station area which was fitted with a float switch and a Perryman/Fitt water tank control system, which proved to be very successful. In July 1970 the ‘Ww’ smoke box was moved and cemented into its current place and in December stage one of the track extensions was started. As this was only a concentric loop just outside of the previous site track, it did not require much extra space or excavation. The track construction was simplified by using vibrapac blocks sitting on each pad, with the self supporting rails anchored to the top of each block straddling the gaps between the blocks. The rails were clamped together and predrilled. The spacing between the holes was increased on the two outer rails for the bends. A barbeque was held on Sunday 14th March 1971 and a small number of members gathered together to celebrate the completion of stage one. Country member Peter Johns from Whangarei brought his new engine down, this was the ‘Britannia’s’ first run on a continuous track and it performed well with Peter returning home a happy man. A larger number of visitors were drawn to the track on a fine day as a result of the publicity from the Easter Show. In June 1971, MWBC approved the stage two track extensions subject to certain conditions including that the whole scheme be completed by the 31st August 1972. In mid August 1971, a band of workers descended on the old track and dismantled it ready for removal. Parts of the new track were also dismantled and stacked to one side so that a start could be made on the building of the embankment, and realignment before being reinstalled in the new position further out. In late September, a bulldozer had worked all the easy part of the cutting leaving two huge piles of dirt, but it was not powerful enough to cut into the hard rock in the deepest section. A large Caterpillar bulldozer with rippers was finally hired to loosen up the rocks. The cutting was levelled off with a pneumatic jack hammer with a large blade. The tunnel pipes were laid in place before Christmas 1971 and the gaps concreted over. Most of the spoil left from the cutting was moved by wheel barrow to build up the embankment of the reverse downhill loop. The tunnel was completed by the end of January 1972 and grassed over. The base of the high bridge was an old transporter frame used for drying timber which Les Fitt managed to get from Lines Bros. before he moved to Claude Neon Ltd. Shortly after he moved there, enough second hand steel arrived from an old sign to build the station and the access foot bridge from the clubhouse; these were all completed early in August 1972. The main frames of the bridge were made from old NZR rails. As soon as the track gang had completed the track to the bridge, various members were giving their engines a work out on the 1:70 grade with on lookers enjoying the sound of the engines as they pounded through the tunnel. Young Dave Watt with his new ‘Tich’ made its inaugural run although it found the grade up through the tunnel a bit hard. 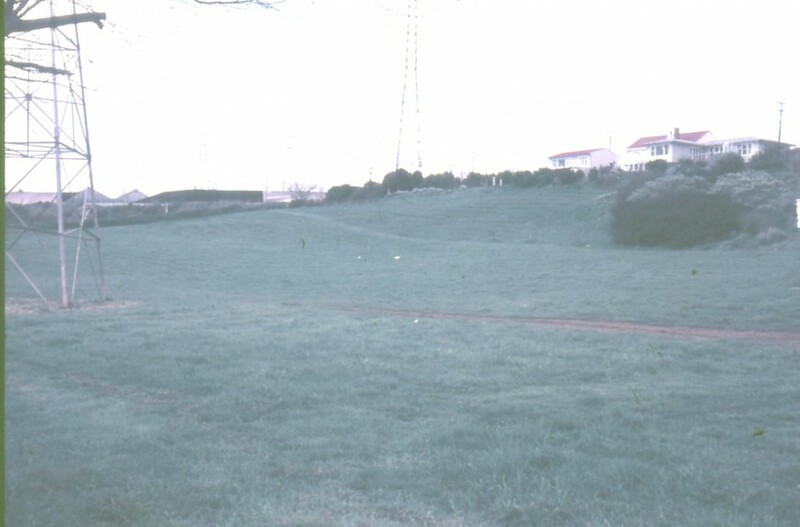 During August 1972, the goal of raising the embankment to its final height had been achieved, and with a few more trees and shrubs dotted around, the place was showing signs of progress. In celebration, another successful barbeque was held with a fine day bringing out locomotives to try out the grade to the high bridge, which brought back memories of the old days when full-sized coal fired locos were going through tunnels, a smell to be ever remembered. Following the barbeque, some films were shown in the Clubhouse. A few days later the embankment and the underpass bridge were finished and by the end of August the sides of the bridge were built and fastened in place with the first run on the completed track being made by Graeme Wilkinson with ‘Washington’ on the 27th August 1972. A lifeboat davit type lifting pole installed at the western end of the station was used to swing the larger locos off vehicles and on to the track. The locos were then pushed around to the engine shed where they were man-handled onto the old steaming stands used at the Swimarama site. The first organized run on this larger track was held on Sunday the 10th September 1972 and on the following Saturday another run was held to help celebrate the 21st Panmure Birthday Carnival. With all the many other activities going on around the basin the Society was overwhelmed by the number of people wanting a ride. This quickly identified a myriad of problems with passenger control at the station, which resulted in fences and gates being installed shortly afterwards. The following fine weekend was the first open weekend on the new track, and 10 visitors took the time out to make the trip, and at times there were up to five trains running on the track. Jack Edward’s (from Hamilton) little yellow 0-4-2T ‘Dodo’ with its rake of four scale wagons of different types was much admired. 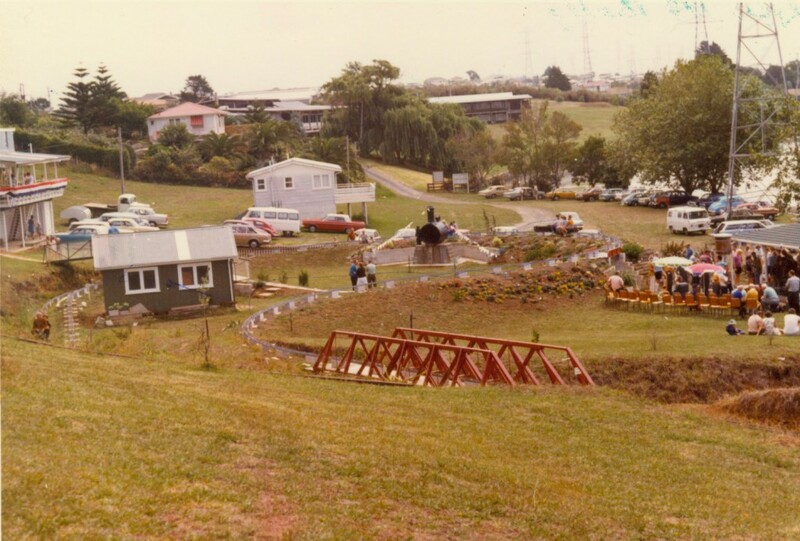 The final stages of work around the site were being finished off in preparation for the official opening on the 29 January 1973, Auckland’s Anniversary day. Three steaming bays were completed, the signals installed and the station finished with seating and safety rails installed. Fences were erected around the top of the tunnel portals. Power and water had been run to the engine shed, which had a steel sliding door fitted at one end. These were ex lift doors from the old GPO building, courtesy of Peter Baker. Russell and Pat Batt once again had been busy planting bushes and flowers around the embankment and trees above the cutting. Agapanthuses were planted along and adjacent to the lower straight on the top loop. Outdoor seats were placed facing the station and in the upper loop facing the Basin. On the due date after short speeches by Les Fitt and the Mayor of Mt. Wellington Bob McCulloch, the Mayor drove Alec’s ‘Britannia’ through a ribbon at ‘Waipuna Halt’ and declared the track officially open. He then proceeded to drive two laps of the track, and by then it was time for afternoon tea and a good chat. Seven locomotives: Geth Creagh’s ‘Ajax’; Harold Joynt’s ‘JW Bowker’; Les Fitt’s ‘Henrietta’; Dave Watt’s 3 ½” ‘Britannia’; and Peter John’s and Alec Holme’s two 5” ‘Britannias’, kept up a continuous service that still did not meet the demand, with some children having to wait in the queue for half an hour. On standby were Les’s ‘Kb 965’; Alec’s new Simplex called ‘Vulcan’; and Gib’s NZR ‘Y’ class Hunslet. The Batt bank was well decked out in flowers and shrubs with lush growth and did much to enhance the appearance of the area. Mesdames Wilson, Watts, Joynt and Anderson helped with the preparation and serving of the afternoon tea.